The SCOUT is very light despite us using swivel bars and strong engines. Even with a full fuel tank, you can grab the paramotor and put it on your back just like a rucksack. No need to kneel down. We have chosen carbon as it is very light and strong. One DTC spar, for example, weighs less than an iphone. The SCOUT feels lighter than it is. If a paramotor stands out too far from your back or sits too low, it will feel heavier as it pulls you backwards. With this in mind the cage is designed so that the heaviest part /the engine/ sits high and close to the body. Even the fuel tank is placed as high as possible. Comfortable position for your hands. With our medium-high hook-in bars your hands are in a comfortable position. Enjoy your long cross-country flights without having to keep your arms high up all the time. Slightly reclined position is needed for comfortable flight. Such recline is built in the SCOUT’s geometry. This way you still have the propeller perfectly vertical, which is its optimal position. 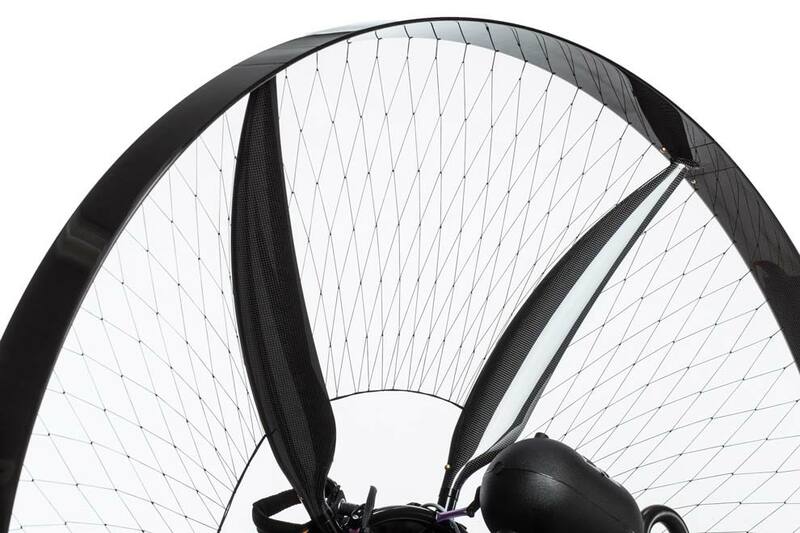 Most paramotors have the a very simplified geometry and the pilot’s back is in line with the propeller. To gain some comfort in flight these paramotors need to sacrifice efficiency and thrust. But not the SCOUT. Yes, take advantage of the unique Dynamic Torque Compensation. No need to hold one brake all the time. Set the trims high, push the speed bar and your direction does not change. Just enjoy the speed. To Arrange a test flight or to find a SCOUT dealer.